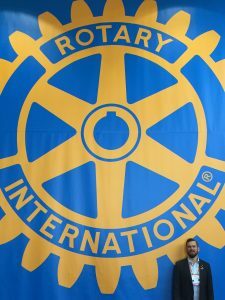 A post by Zach Tilton – Bradford Rotary Peace Fellow 2016-17, class XV. I was lost and ambling in one of the massive concourses of the Georgia World Congress Center in Atlanta, home of the 2017 Rotary International Convention. I happened to be looking for the Rotary Peace Assembly, one of the pre-convention events that would bring together past and present Rotary Peace Fellows and Rotarians to learn, collaborate, and strengthen each other’s work in the field of peacebuilding and conflict response. With over 30 thousand Rotarians expected to converge in Atlanta in the coming week, I was glad Rotary was investing the time and resources to get fellows and peace-minded Rotarians in the same room before my proverbial swan-dive into all things Rotary. 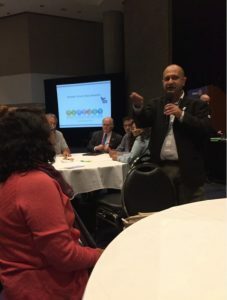 As a newly-minted Rotary Peace Fellow at the University of Bradford I decided the best way to deepen my appreciation for Rotary’s investment in my future as a peacebuilder was to immerse myself among Rotarians from all around the world to hear their stories of sustaining peace. 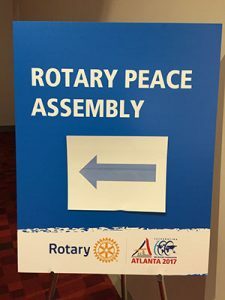 What follows are my reflections from that swan-dive, specifically from the Rotary Peace Assembly, the Presidential Peace Conference, and the Rotary International Convention. I finally found the room for the Peace Assembly and was drawn in with the help of a Jumunji-like bongo drum rhythm being banged out by one of the facilitators. After a period of mingling and introductions to other assembly participants, the facilitators started the session by recognizing the indigenous peoples whose land we were on, outlining the format and theme of the assembly, and jumping right into a guided mediation activity to get us in the right headspace. “Now imagine you are on the bottom of the ocean swaying back and forth like a strand of seaweed”, one of the facilitators said profoundly in a calming voice halfway through the exercise. “Oh no”, I thought. “What have I gotten myself into?” While I can appreciate the power of mindfulness, I tend to have a visceral reaction to fuzzy, ambiguous discussions around world peace that don’t translate into action, which often start with the mawkish tropes of inner and outer peace and guided meditations. However, I decided to temper my personal peace-prejudices and just go with the seaweed-flow. I am glad I did. The facilitators rightfully recognized that to fill a room with successful practitioners and not draw on our collective experience would be a complete waste. Therefore, the essence of the Peace Assembly was in an unconference or Open Space format where participants were invited to self-organize into special interest groups and discuss topics relevant to our work and research. I participated in sessions on peace education, peace tech, and was given the chance to facilitate a break-out group on evidence-based peacebuilding where we wrestled with issues of accountability and learning and the challenges of grounding our interventions in reality and understanding the impact of our work. Despite the great discussions in these groups, what they really did was serve to orient the participants to each other’s work and interests so that we would have the chance to reconnect through the balance of the assembly and discuss potential collaborations with one another. That’s exactly what we did. In session transitions, during lunch, and on our bus rides over to the Peace Assembly Reception at the Carter Center that evening, I was able to gravitate toward and learn from Rotary Peace Fellow Alumni on how they were applying the skills and resources they derived from their fellowship to their work in sustaining peace. Conversations ranged from incorporating indigenous ways of knowing in decolonizing peacebuilding methodology, to emergency humanitarian response in conflict affected zones, to working with women’s groups for various empowerment projects around the globe. These conversations that started in the morning continued through the evening at the Carter Center where we heard from Ambassador and Carter Center CEO Mary Ann Peters along with Rotarians who were working to increase the institutional capacity for Rotary clubs to work more explicitly with peacebuilding projects in their communities. The activities picked back up on the following morning with a world cafe that explored the three themes of the conference which taken together share a message by themselves: Stories. Sustain. Peace. As we explored these ideas by rotating between the tables of the room, tensions arose around some recurring themes from the entire Peace Assembly: the role of self-care in an organization that emphasizes service above self; evangelizing a universal conception of peace and the potential violence of defining peace for others; and focusing so much on conflict response in foreign contexts that we fail to build peace in everyday means in our own communities. Maybe these tensions and others like them are just what Rotary Peace Fellows and Rotarians need to sustain peace. Maybe this is the creative tension that Dr. Bernice King would later remind us of that her father insisted was necessary for growth, change, and the realization of justice. As the Assembly wrapped up and we were challenged to make commitments to act in light of our impressions, I couldn’t help but look around, recall the conversations of the last day and a half, and feel a sense of confidence that I and my colleagues were ready to work with that creative tension and that by so doing we could realize the possibility of sustainable peace. Zach Tilton is representing Idaho Rotary District 5400 as a current Fellow at the Bradford Rotary Peace Centre where he is exploring the role of everyday indicators of peace in the design, monitoring, and evaluation of peacebuilding programs.